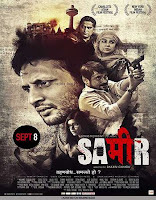 Sameer 2017 | FunToMovies 300 Movies '+g+"
line: After a series of bomb blasts in Hyderabad a special ATS team lead by officer Desai name Yasin Darji as the suspect. Following a tip-off the team reaches a location to arrest Yasin only to end up arresting Sameer, the wrong guy. While the error needs to be fixed, the higher authorities decide to bargain with Sameer for his freedom, sending him as a mole. Sameer turns a mole to stop Yasin Darji before he kills more innocent people. A chase begins. Will they manage to stop Yasin, or will Yasin trump?